Delta Air Lines ordered 100 Boeing 737-900ER aircraft to replace retiring narrowbody aircraft in its fleet, the U.S. carrier announced Aug. 25. Delta says the 180-seat aircraft, powered by CFM International CFM56-7B engines, will be delivered between 2013 and 2018. The first 12 will come in the second half of 2013, with 19 more arriving per year from 2014 through 2017 and the final 12 in 2018. The 737-900ER will replace Boeing 757 and 767 and Airbus A320 aircraft in Delta’s fleet. With a range of 3,200 nautical miles, the Boeing 737-900ER can operate on any domestic route offered by Delta, the carrier notes. 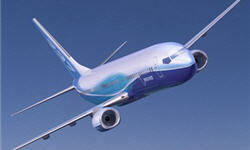 The aircraft is the highest capacity, longest-range airplane in Boeing’s single-aisle fleet. Delta did not say whether this is it for its near-term domestic narrowbody replacement plans, even though this order does not include any smaller narrowbodies. Questions will remain on that front, including speculation about a future order for a larger Embraer or Bombardier’s CSeries. The airline has been focused on reducing its adjusted net debt to $10 billion by 2013, from nearly $14 billion at the end of the second quarter of this year. Each of new 737-900ER aircraft has committed long-term financing, Delta says. It adds that the size and timing of the order will allow it to maintain its annual capital expenditure run rate between $1.2 billion and $1.4 billion over the next three years and will not impact the company’s $1.2 billion of capital expenditures projected for 2011. “A key component of Delta’s strategy is making prudent investments for the future while maintaining our financial and capacity discipline,” Anderson says in the press release announcing the order. The aircraft order has a list-price value of more than $8.5 billion. The engine order has a list price value of $2.2 billion, CFM says. via Delta Orders 100 Boeing 737-900ERs | AVIATION WEEK. This entry was posted in Airplane Models, Diecast Airplane Models, Hobbies and Toys and tagged aircraft replicas, airplane models, Collectibles, desktop models mahogany models, diecast model airplanes, Hobbies and Toys, model airplanes. Bookmark the permalink.